This is the episode where Perry asks Paul about his bedside manner, then sends him off to investigate the increase in heart attacks for the Safeline Insurance Company. Perry appears to have gone too far when he tries to prove convalescent fraud and pushes an ex-fighter to his limit. The guy dies of a heart attack. Perry suspects he was poisoned but the insurance company suspects Perry�of murder. Location: Right after the scene where Della says Paul is dying, there�s an establishing shot of a building. It�s the L.A. County USC hospital in Boyle Heights known as �Big County.� See here. Submitted by Mitch English, 5/21/2005. Location: Los Angeles Memorial Sports Arena. An establishing shot of the arena appears early in the show. See here. Submitted by Scott Pekeris, 7/1/2005. Location: About 36 minutes in, Paul says he�s on Sycamore and Sunset Blvd. in Hollywood, and lo and behold he is. If you look to his left you can see a woman with some kids and to the left of them you can see the Travelodge at 7051 Sunset. It is still there. See Google maps street view here. Want more proof? Look closely at the top corner of the building. You can clearly see the little �sleepy bear in PJs,� which was Travelodge�s logo in the 1960s, painted on the top left corner of the building. Posted by Eric Cooper, 9/2/2009. Some pictures here. Location: About 37 minutes in Paul gets dropped off at the YMCA which is still at 1553 N. Schrader Blvd. in Hollywood. If you look closely you can see �1553� on the building as Paul enters. The YMCA would be about 8 blocks east of the previous Sycamore and Sunset location. Posted by Eric Cooper 9/2/2009. Some pictures here. Location: About 8 minutes in we see the exterior of Nappy�s and a sign below it that I think reads �Sunset Grill.� If so, that would be the place made famous by the Don Henley song of the same name. The place still exists next door to Guitar Center on Sunset but it has been drastically remodelled, and I can�t find a vintage photo to compare. Anyone have a photo? Submitted by Eric Cooper, 17 September 2010. + No photo, but the sign definitely says �SUNSET GRILL.� But it looks so temporary; could that really have been standing for forty-six years? Submitted by gracenote, 5/14/2011. Early in the episode, Nappy reads a completely blank newsp�per. + There is printing on the newspaper but it's very light with no apparent headlines at all. Submitted by Wiseguy70005, 12/12/17. Uncredited Actors: Don Anderson appears as a Paul Drake operative in this episode. Don and William Hopper keep Jerry Ormond (Benny Baker) under observation at the construction site. Submitted by FredK, 11 January 2011. + In a subsequent scene, Anderson plays a patron at Clay�s Grill who leans back to stare as something happens. Submitted by gracenote, 5/14/2011. Sightings: At the doctor�s office, our �Miss Carmody� plays the nurse who retrieves the oxygen and consoles Mrs. David. Submitted by gracenote, 5/14/2011. + Life was to follow art all too well: in less than five years from this episode William Hopper was dead, although from complications of a stroke rather than a heart attack...a sad ending that must have seemed every bit as shocking to his audience as Paul's demise would be to Perry. Recorded by Notcom 060716. 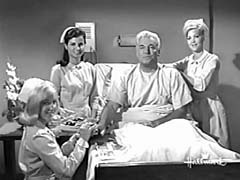 + + Indeed: Early in this episode, airing October 1965, we have Paul, Burger and Perry musing over the untimely death of the boxer, saying "He seemed as healthy as you or I." William Talman died in August 1968, and William Hopper in March 1970. JohnK, 12 February 2018. Whit Bissell appeared in 4 original & 2 "New Perry Masons" ("TCOT Jailed Justice [Trial Judge]," "TCOT Prodigal Prophet [Judge]"), 2 Ironsides, an "FBI," a "Star Trek: The Trouble With Tribbles" & All 30 "Time Tunnels" as General Kirk [IMDb]. Mike Bedard 2.11.15.
Credit anomaly: Alexander Lockwood, identified as "Deputy" in the episode's closing credits, actually plays the Coroner who presides over the inquest. Submitted by alan_sings, 1/18/2013. + The credits say Dr. Chauncy Hartlund but the name on his office door is Chauncey. Submitted by Kilo 1/22/2018. Continuity: When the little boy rings the doorbell of Jack David's house (with Paul and his operative apparently watching from across the street), the lighting changes suddenly from the wide shot to the close-up. Then we (and once again Paul and his operative) see David and the little boy in what appears to be the back yard of the David house. But there's no way Paul and his operative could watch both the front and the back of the house from the same location across the street. Submitted by Alan Smithee, 1-31-2014. Continuity: When we first see Arthur Wendell he is standing in a doorway of the hospital with a plain background. Then we see a close-up of him already in the room before he enters. This brief shot was taken a minute later in the episode after he threatens Perry. Submitted by Wiseguy70005, 12/12/17. The employees of Safeline were apparently mathematically challenged (maybe that's why the company was in trouble!). When Watson says that Safeline had seen an over 500% increase in coronary disability in the last three years, the chart he points to doesn't show a 500% increase. Then when actuary Groody is in Mason's office he jokes that they've taken the square root of minus one and made mathematical history. Evidently he's unaware that so-called imaginary numbers had been used extensively in mathematics, engineering, and science since the 1700's. This is surprising, since actuaries typically study a lot of math in college. Submitted by 65tosspowertrap, 1/31/2014. + But it would have little place in an insurance company - or a law office - which, of course, is why it's funny. OTOH they don't seem to handle exposure very well: we're to believe a single - and dubious, at best - lawsuit is so threatening to the company's future that they're in a panic to settle; certainly an insurance company, of all businesses, would provide for such routine risks. Noted by Notcom, 060716. Random musings: An entertaining episode about disability insurance fraud (considering the number of ads I see on TV for law firms specializing in disability cases, evidently it's still lucrative business). Dr. Caudere's "Cardsyn Tonic" looks suspiciously like milk; can't tell if it's whole or 2% ;). "Caudere" sounds a lot like "Kildare" as in the TV show Dr. Kildare, which was on NBC 1961-1966. "Rod Steele": what a great name for a construction worker. Ex-boxer Hal Baylor was perfect as ex-boxer Jack David; note how effortlessly he skips rope (the little boy can't even get started) and works the speed bag. Submitted by 65tosspowertrap, 1/31/2014. + And a Dr. Hartlund ...as in Heart/Lung ?? Yes, the writers had quite a little yukfest going with this one. Noted (with amusement) by Notcom, 060716. When Dr. Caudere is explaining what a cardiopathist is in the coroner's office he explains that he uses esoteric drugs he discovered in South America. Seems to me that should have raised suspicion since drugs have to be FDA approved. Submitted by Kilo 1/22/2018. "The Case of the Proliferating Pitkins." This episode's credits indicate that Orville H. Hampton wrote the script, but one suspects that ESG must have been leaning over Hampton's shoulder when it came to creating some of the characters' Pitkin-like monikers: Reve Watson, Wallis Lamphier, Chauncy Hartlund, and, best of all, Dennison Groody. Submitted by BobH, 06 February 2018. + There's also a nonsensical scene in the hospital: the doctor tells Perry "we pumped his stomach and administered medicine"; the former is SOP for poisoning cases, but with no idea what the poison was, there would be little hope of finding an antidote. Submitted for your disapproval by Notcom, 060716. In a scene in the coroner's office, when Perry is exposing Dr. Raul Caudere (Joseph Sirola) as a phony, he addresses Caudere in French, his supposed native language. But of course Raul would be a funny name for a Frenchman, being it is Spanish. Though it is used in France, but always spelled as Raoul. ++Actually this occurred at the inquest not in the coroner's office. Kilo 1/22/2018. It seems to me that added to the suspiciousness - if the quack, Raul was trying to pass himself off as French, but without enough knowledge save a phony accent, he might not have even known that 'Raoul' was the right spelling. Or cared. Most con men aren't as smart as they think they are ... but there was a point in the show that puzzled me. Paul gets the note to get into the scheme in his locker, and as the instructions on it tell him, he burns it. I wondered why he did that, since it was evidence! Then again, if he hadn't burned it, since he might have been watched, that would have spooked the crooks, and they might have hit the road .. hmm! Submitted by MikeReese, 6/24/2017. A CORONER is "an officer, as of a county...whose chief function is to investigate by INQUEST...any death not resulting from natural causes (from the Anglo-French word "Corouner," Supervisor of the Crown's pleas, per Webster's Unabridged Dictionary). Like an Attorney, a Coroner is an Officer of the Court. "Quincy, M.E." points out that a Coroner is not always an MD; WUD defines a MEDICAL EXAMINER as "a physician...who is appointed...to perform autopsies on the bodies of persons supposed to have died from Unnatural Causes & to investigate the...Circumstances of such deaths." Mike Bedard Presidents' Day 2015. In an appearance on The Jack Benny Show from 1962, he also speaks French in a sketch, which leads one to wonder if he was fluent in the language. While from Canada, he was born in British Columbia, far from the French speaking part of our northern neighbor. Submitted by PerryDixon 2/4/14. LOL: Paul not only gets the poison caused heart attack, with all that pain, he then gets hit in the face w/the volley ball...even though softly...still "I hate when that happens!" <said in a Billy Crystal SNL voice!>! ...but it all works out as he gets FINE treatment w/all those hot nurses!!!! ;-> Submitted by mesave31, 02/16/15. By the end of the show, Burger had enough evidence to charge 4 or 5 people in the scam. I liked the overall show despite some plot holes plus Della gets to show more emotion. Submitted by Perry Baby 1/4/17.